Marble Wash Pattern Scarf with Tassels in Gift Box. This light weight scarf is a great gift for Mother's day. This fancy flamingo lightweight woven scarf with hanging corner tassels is the perfect summer scarf. Perfect gift for Mother's Day. Colorful Otomi Scarf in Gift Box. 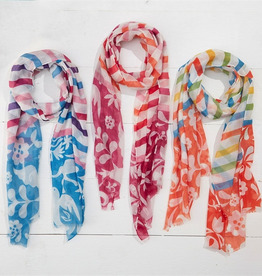 This light weight scarf is a great gift for Mother's day.